Rinse chicken, pat dry and place in a large soup pot. Fill pot with enough cold water to cover chicken by 2 inches. Add garlic, ginger, scallions, rice wine and 2 tablespoons salt. Bring to a boil, reduce heat and let simmer until the chicken is cooked through, about an hour. Remove from heat and transfer chicken to a bowl. Let stand until cool enough to handle. Meanwhile, cook sushi rice according to the package replacing half the water with broth. Strain remaining broth and set aside. Remove skin from chicken and shred meat into bite size pieces. The carcass can be saved and used to make stock. Sometimes I freeze carcasses until I have a few and then boil them up all at once. 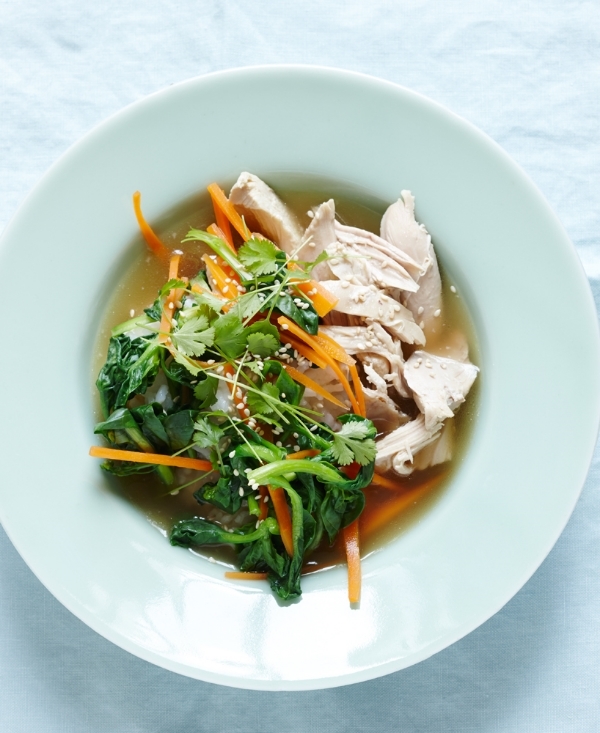 Return chicken to strained broth. Add vegetables and cook until just tender. Adjust seasoning with salt. Serve over prepared rice - with soy sauce, sesame oil, cilantro and sesame seeds if desired.